A very rare 18th century publication - The Birds of Great Britain with their Eggs by William Lewin - sold in Tennants Auctioneers’ Book Sale on 15th March for £11,000 (plus buyer’s premium). Despite missing two of the seven volumes in the set, the rarity of the work attracted fierce bidding in the saleroom. 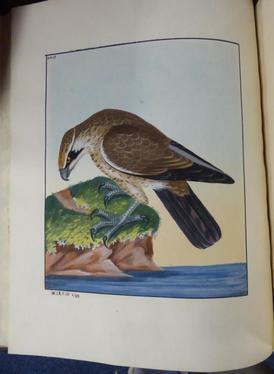 Beautifully illustrated with hand-coloured plates, the book was published for the author between 1789 and 1794, and only sixty sets were produced. William Lewin (1747-1795) was an English naturalist and illustrator, and this publication was the result of twenty years’ work. Over the years, many copies have been split up into individual watercolours, making existing copies all the more sought-after. Elsewhere in the sale, strong prices were achieved for a volume of drawings made by Joseph Green depicting his voyage from England to New South Wales, Van Dieman’s Land and Bombay in 1829. Green produced this collection of sketches, ink washes and watercolours for his cousin Samuel Farmer ‘who used to be fond of drawing’, according to the inscription. This unique and personal record sold for £2,200 (plus buyer’s premium). A collection of letters written by Prince Philip to his prep school headmaster and his son were also well-contested in the saleroom. Sold as five lots, the letters achieved a combined hammer price of £4,700. Also of note were a scientific tract - An Essay on the Food of Plants and the Renovation of Soils - by John Ingen-Housz, which includes the first description of photosynthesis sold for £1,300 (plus buyer’s premium), and an interesting hand-written Commercial Investigator’s Journal, possibly written by Augustus Hughes, detailing his investigations into the Porto wine trade sold for £950 (plus buyer’s premium). Full results are available on Tennants’ website. Image: William Lewin ‘The Birds of Great Britain and their Eggs’ - Sold for £11,000.